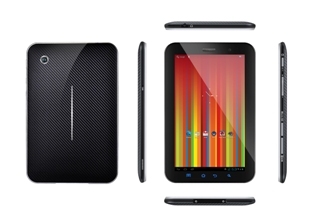 Gemini announce two new 7 inch tablets: Looking good for budget devices! There's not too many companies which are from the UK and are famous in the tech world, but there's a few companies which are having a go at making a name for themselves. Gemini devices are certainly one of them. The likelihood is that you've heard about their efforts with their budget tablets before, they pop up quite often, but today they've unleashed a pair of 7" tablets and they're quite compelling options for their price! First and foremost is the more expensive of the two, the JoyTAB Duo 7 3G, pictured right. It's a solid little tablet, but obvious the main selling point is the 3G connectivity, but there's a good set of specs too. There's a dual-core Cortex A9 processor, 1GB of RAM, 4GB of internal storage which is MicroSD expandable, 0.3 and 2MP cameras on the front and rear respectively, as well as your usual set of connections and receivers which include WiFi, GPS, Bluetooth, 3.5mm headphone jack and G-Sensor. All of this runs on a capacitive 5 point Multi-Touch Screen which is 7 inches and has a resolution of 1024 x 600p. Other than that there's a nice, big 5800 mAh battery and the tablet is currently running Android 4.0 ICS, but there's an update to Android 4.2 Jelly Bean in the works as we speak! All of this can be yours for a recommended price of £139.99, which seems very reasonable indeed! The second tablet is another 7 incher, but this time there's no 3G connectivity, but there's also a considerably lower price point too! 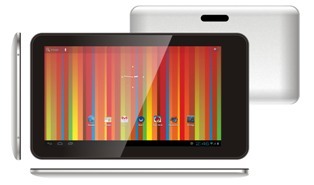 The JoyTAB Duo 7 shares most of its internals with the 3G sister: there's that dual-core processor clocked at 1.6Ghz, the same capacitive 5 point Multi Touch screen with the 1024 x600 resolution and 1GB DDR3 RAM. This time though, there's 8GB of internal storage and Micro SD card support, as well as the same 0.3 and 2MP camera options. The only slight downside is that the battery is quite small, coming in at 2800mAh, but with Android 4.1 Jelly Bean, a sleek 9mm thick chassis and a RRP of £79.99, it's a very compelling offering, perhaps even better than Acer's Iconia B1, which is £20 more expensive! The device is pictured below and it does look rather aesthetically pleasing! What do you think? Would you be interested in picking up either of these two devices? Let us know in the comments below!